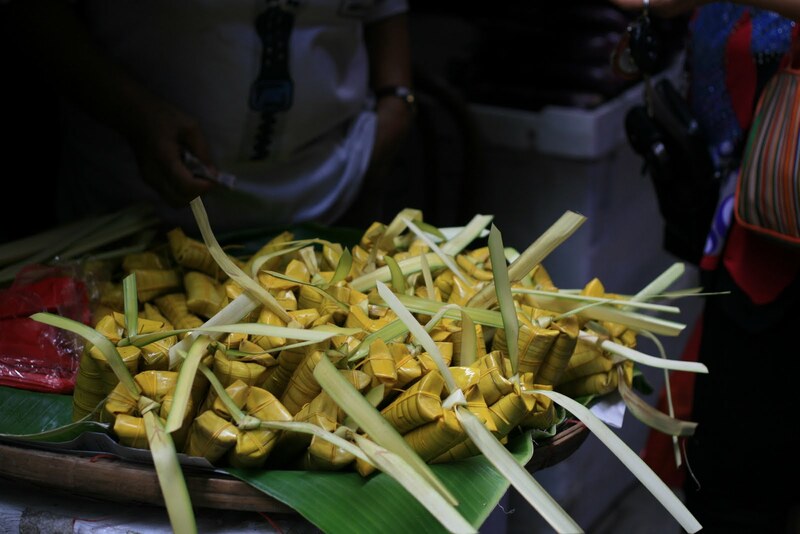 400 hundred years of history rolled up into 4 hours of gastronomic treat and burning extra calories was the highlight to this ultimate food and oriental culture guide to Manila’s most vibrant and colorful historic quarter – Binondo, Manilla’s own China town. Old Manila Walks, one of Manila’s walking tour outfits brought me, Bokz and Rixie to this amazing walking tour into one of Manila’s ‘a must-visit’ tourist attraction. Special thanks to Ivan Dy, the earnest tour guide for this rich in historical learning (and very busugful) experience. The 4 hour walking tour started at the Binondo Church or the San Lorenzo Ruiz church with the introduction of the colorful Chinese influence in the country. After learning so much in just a 30 min talk by the tour guide (lahat pala ng Chinoys nag originate from Fujian province including our taipans today), we then proceeded to the Plaza Calderon dea Barca ( Hue Heng Khao ) one of old Manila’s important commercial squares. After taking photos we immediately embarked on a few seconds of walking and stopped at an old slippers store w/c manufacture and sell authentic Chinese slippers including those worn by the ‘lotus feet’ (Kris Aquino dead ringer anyone? I’m referring to one of her horror flicks darn it). Ivan told us that the store could be the last remaining store selling that kind of slippers. After, we went on to the fire man’s café to have our very first food tasting. We had salted rice (but it wasn’t salty) and a fish ball soup, of course they had Chinese names but I was not able to note it so pardon me on that. After a few minutes of eating, we then went on with the walking tour to one of yet another old Chinese store inOngpin St. selling Chinese paper money that is used by the Chinese to burn during festivals. We then proceeded to our next food tasting segment. We went to this small dumpling eatery where they serve almost all kinds of dumplings including the ever famous ‘siao mai’. While eating we also were able to absorb lots and lots of China’s past and the Chinese people’s adventures in their quest for a better living in the Philippines(trust me andami kong natutunan). We then went on walking and we stopped at Rosario St., (Chiu Wah Hua) the southern entrance to Chinatownwhere the ever famous Chinatown Arc can be seen. We then advanced to China town’s main business district and went on towards this small siopao factory. And yes, the siopao there was authentically Chinese made, something that doesn’t necessarily taste like asado or bola bola (the Filipino siopao that is). We were also able to taste an authentic Chinese ‘shakoy’ or ‘pitso2x’. (I can say the pinoy shakoy tastes a lot better though hehe). The walking went on and we ended up in Carvajal St. China towns small wet market alley. We first barge into a specialty shop (our first taste of airconditioning in this trip) to buy some pasalubongs. And in this store we were able to taste a wide array of hopia flavours – 7 to be exact (monggo,pandan,ube,baboy etc etc). it was here in this area that I gave up on eating since I am more than full already. Then we coursed our way to the wet market alley and it felt like I was really in hong kong since it really looked foreign for me. We went on to our last destination, an authentic Chinese lumpia house named New Po-Heng lumpia house where we were treated to yet another authentic Chinese prepared fresh lumpia. I just had a few bite and no offense meant I really wasn’t able to finish the whole slice given to me. After a few more minutes of indulgence, countless picture taking w/ the group and 5 more new friends added in my ‘walks of life’ friend’s list, the tour was finished w/ our stomach full and our minds rich in history and appreciation of not only Manila’s but most probably the world’s most colorful and most intricate cultural ethnicity. Now I wanna learn some mandarin and foukien.